A couple of years ago, I was asked if I would teach children’s Sunday school. An admitted struggler with the word “no,” I reluctantly agreed to teach once a month. You see, while this farm mama has a gift with the four-legged children, I fear I have no such gift with the two-legged variety. After a couple of Sundays, I quickly learned that a room full of antsy middle schoolers, mostly boys, positively scares the beejeebers out of me. However, my favorite Sunday of all to teach was Palm Sunday. It was when my love of the four-legged got to have a part in my lesson, at least through pictures. I had heard about the legend of the cross and donkey, and given the beautiful crosses that Sweetie Pie and Mama Rose both wear on there backs, I wanted to know more. So I spent a little time to look it up and research it for the kiddos. 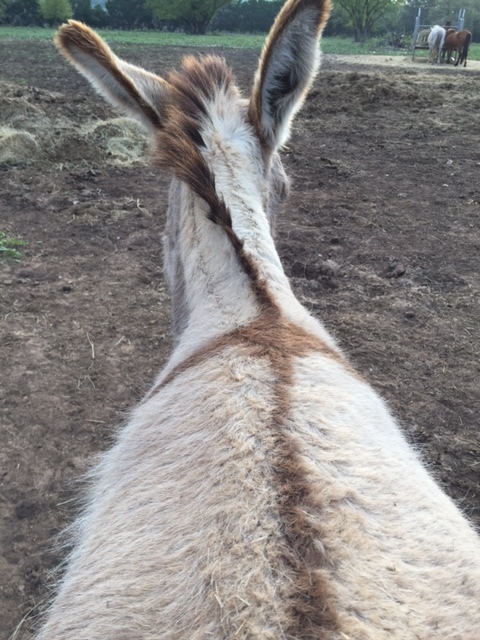 The story goes like this (in a farmgirl’s words) … when Jesus was heralded on Palm Sunday He rode in on the back of a sweet donkey. At that time, the donkey did not have a cross. The little donkey loved Jesus and was so proud to carry his Lord and Savior through the town. A week later, when Jesus was crucified, the donkey was heart broken. He stood in the back of the crowd and watched as his Jesus died, tears falling from his gentle eyes. The donkey could not bear to leave Jesus, so he stayed until the shadow of the cross fell across his back. From that moment on, the donkey carried the cross of Jesus to show his love for his Savior and King. On the third day, when Jesus rose from the dead, the donkey rejoiced and passed his beautiful cross markings on to all those that came after him. Sweetie Pie and Mama Rose are Jesus donkeys. On this Easter weekend they proudly display their crosses. So on this Easter Sunday, we think about our donkeys and the symbols of Jesus that they carry all year through. We wish you and your family a blessed celebration of the ultimate sacrifice and gift that is Jesus. P.S. That was my last Sunday to teach and I think it ended on a perfect note. Teachers, you have my respect and thanks for all you do. You are truly special, and I don’t know how you do it, but I’m honored for the experience and I hope those kiddos will always remember the donkey and Jesus. P.PS. Another great story source http://www.mdresort.com/legend-christian-donkey/.